← Who’s Going On Your Fifty? This sounds very neat but don’t the fcc as well as the cell companies take a dim view of your using their frequencies? It’s okay, we take a dim view of them too so it’s mutual. It’s worth noting that modern phones use different bands. This won’t interfere with their current business. Keep it low-power, keep it indoors, don’t leave it turned on for a long time and you’re pretty much fine. A very dim view indeed, from what I have heard. I’m fairly certain it’s illegal in the US to even LISTEN to cellular frequencies, though good luck to the FCC on enforcing that one. That part wouldn’t be an issue in Europe as these frequencies are not “cellular” anymore for the most part. E.g. NMT used to run at 450MHz or so, just above the 70cm HAM band. These days the frequencies are re-allocated to other uses already. However, it is still illegal to transmit there without a proper license and even where the frequency is now for public unlicensed use (e.g. PMR or ISM bands), you aren’t allowed to use uncertified homebrew gear there – which is what an SDR radio or running an old cellular radio would certainly count as. Pretty sure it’s illegal to spoof phone numbers over VOIP to pull off massive automated phishing scams too, but that’s like 90% of phone traffic these days and the FCC won’t do a thing because telecom companies make money off that traffic, and the FCC is totally captured by the industry it’s supposed to regulate. Illegal or legal, ethical or unethical–experimenting with this stuff isn’t hurting anyone or costing anybody business. It’s of less concern than speeding or jaywalking, both morally or from a safety standpoint, plus both of those are illegal yet just about everyone does it flagrantly anyway. I don’t think the question of legality is always necessarily relevant. I also don’t think the FCC is worthy of respect. They won’t do their job properly, so it’s on individual hackers and hams to make sure they’re being responsible with the technology. They’re usually more vigilant and trustworthy in that regard. The FCC hasn’t given a damn about the law or the greater good for a while now–they exist soley to fork over monopolies to big telecom and make free-market competition impossible. It’s not even like they try to hide it anymore. Same goes with other brain washing, cult programming and mind control that most deny… I’m sure is illegal and only the earmarked government scapegoats get caught and sent to prison. Trillions missing from the DOD and trillions in U.S. Jurisdiction debt? Where did the taxpayers money the government received and spent go? Compounding and concealing their most advanced technologies that most deny along with payouts to those guilty of collusion, conflicts of interest profiteering, war profiteering and even war crimes using the range of intelligence gathering discipline in a not well disclosed electronic economic warfare ways and means is my guess. Yep, these guys are pretty much asking for a serious fine, even if their system runs at very low power. E.g. 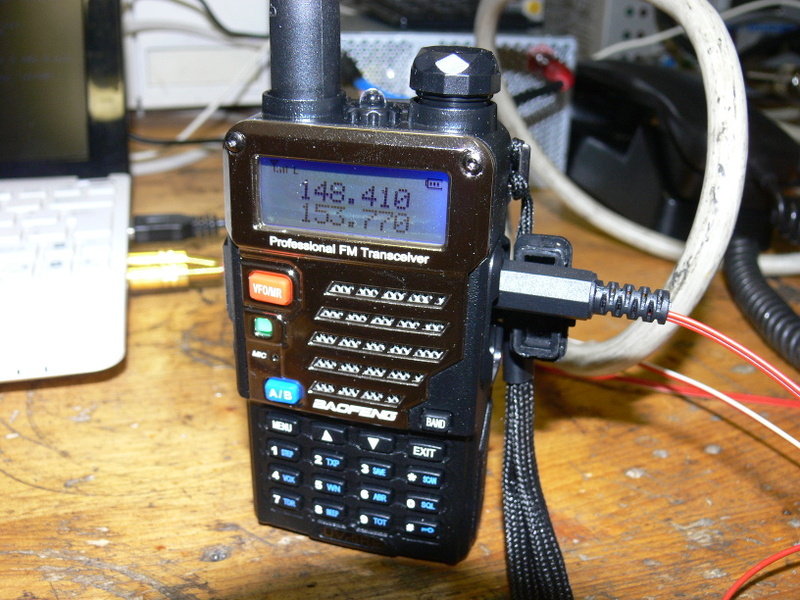 that 148.410 on that radio in the photo is a PMR frequency – they probably won’t cause intereference to anything of significance there but any sort of homebrew gear on PMR is not legal. Still wondering what the most cost effective (cheapest) homebrew, DIY, commercial off the shelf FCC certification system looks like? Wondering if can be made with an SDR? I mean… think about how some really expensive pre-80’/90’s spectrum analyzers alone were and now even better performance can be accomplished with a computer with a sound card and SDR’s using a microphone and/or antenna. Can even be made to be signal and sweep generators as well as more if you know how to program. Would be interesting to see made with salvaged, re-used, re-purposed or even cheap Chinese gear and might even be an interesting milestone for a system for someone to champion to sell commercially or at least have available as a service for events/labs. Neat build, looks like a cool project(s) and thanks for sharing. In the US, this frequency is quite simply illegal to transmit on without a license. It’s outside the amateur band, so not THAT license. Think you’re keeping the power low enough that your interference won’t be noticed and tracked down? Wanna risk it? The FCC does not play around here, especially when you intrude on frequencies commonly used by local government for critical services such as police, fire, rescue, utilities, air traffic control, etc. Unless you’re experimenting inside a Faraday cage, you’re probably going to lose all your equipment and fined tens of thousands of dollars. Monitor the frequency you intend to use for a bit and make sure you go as low power as you can and you should be ok really. Enforcement works off reports. If the freq is quiet in your area and you’re not hurling tonnes of sauce into the void I doubt anyones going to whinge to the fuzz. Yet another millennial who read a book and has nk idea of the legalities. Ham radio licensing doesn’t give you Carte Blanche use of the Em spectrum. This is, illegal. Anywhere. Doesn’t matter if the frequencies have been repurposed, not used for cell jn your country, etc. I don’t know of any modern government that doesn’t exercise their sovereign rights to control the EM spectrum within their borders. None, that I know of. This totally falls into the ‘this is how I did it, but I’m an idiot, and you shouldn’t do this’ category. You can probably get an experimental license for this (cellular network software development) quite easily. Especially if you can reconfigure the radio in the phone so you can put a wide frequency range on the application that the licensing agency can choose from. I did this in the past and had no problems, except quite a long waiting time. I’ve mentioned this before bur, here it is again. Years ago I had some friends who were playing around with AM transmissions just above the broadcast band. They could not hear anyone else there so thought they would be ok. Shortly, they got a visit from the radio inspectorate. As it turns out, they were putting out a signal that fell smack on top of the local fire brigade radio. My friends were lucky they just got a smack on the wrist, but they did loose ALL their electronic equipment. Everything that was remotely associated with their “fun” went away. This project is interesting but quite illegal and very irresponsible. It is interesting to see how some folks think the regulations don’t apply to them. I bet they would scream if someone else impacted them by doing something illegal. Similar story with my neighbor. Their dad had a CB in his boat, kids were messing around with it, cussing at who ever was on. Well, they ended up on the local police band, and the popo didn’t appreciate it. They were originally going to seize the boat, but the dad talked them down and they just took the CB and antenna. Kid mowed a lot of lawns that summer to pay his dad back. Instead of bluntly telling how illegal or stupid this is, how about educating us how to keep the signal only between analog phone and the “tower”? This guy has done awesome job, and now nobody should benefit from it or explore it, because it might cause interference on the air? Help to stay off the air then because someone will try anyway: what do you need to hook up two Baofeng/Pingpong/whatever radios to an analog phone so that nothing leaks into air or range is about a few inches at best? I’ve seen old lab equipment, “cellular test sets” on Ebay, and AFAIK they use an antenna cable between a phone and the set, so “it can’t be done” isn’t the answer here. Or should this site name be changed to “HackA… NO” and hide/ban everything which might cause trouble or bother someone, or did the site step on old&grumpy amateur radio ground and miss the “we know but won’t tell you” sign, or what’s the matter? A Faraday cage is the standard solution in industry. Or charter a fishing boat and go 100+ miles offshore. Facebook and Google do their work, sometimes, under the guise of “providing internet access to the developing world” – there are countries where licensing can be done rather easily. Google also has some licenses in the US in the 3.5 GHz range. Finally, there are wide swaths of spectrum where the FCC doesn’t license below certain very low powers, and we’re talking microwatts. As mentioned above, experimental licenses under 47CFR5 (“Part 5”) aren’t that impossible to get, especially under the auspices of an accredited institution that grants four year post-secondary degrees. Finally, these same institutions were granted licenses at 2.5GHz (although a fair number of them sold their licenses to commercial outfits!) that allow a broad range of uses under the umbrella of “education” writ large. I’ve often wondered if something like this could be used like en Echolink for texting. I guess texting wasn’t possible on the analog system was it? I wouldn’t worry about the FCC in the United States. I’ve had a full scale jammer on my ham radio system for almost a year. So far after notifying the FCC. NOTHING. So use a dummy load. No problem. Just be careful the Radio Police or the Internet cops will get you. 73, have fun and learn something. I tried for years to try to get the FCC to do something about the rampant unlicensed use of business frequencies here in Indianapolis. I emailed back and forth with Riley Hollingsworth himself. Nothing was ever done. I would not work up a sweat over being tracked down. The FCC is kind of like an exotic pet. It’s unpredictable. Most of the time it doesn’t come after you. So you see others flaunting their rulebreaking and nothing happens. You think it must be safe to just do what you want how you want to. You start to play and then BAM! They grip you in their maws. All your equipment is gone, you have a fine that you can never hope to fully pay off and you just might even be going to jail. All the while, yes.. that a$$h0l3 broadcasting hate on the hambands or qrming your business frequencies is still at it with no consequence. Don’t play around with that. There are plenty of legal projects to spend one’s time on. It’s not complicated… the FCC Enforces against sources of interference complaints by other spectrum users, with priority for public safety. They also pursue unlicensed “Pirate” broadcast stations: such stations are deemed an immediate danger to public safety, because in FCC’s words they would not automatically broadcast government messages in an emergency, and might attract listeners from licensed stations. Beyond that, the FCC responds to complaints from businesses and consumers of non-compliant activity that those businesses or consumers say harms them, pursues any manufacturers or businesses making or retailing non-compliant equipment, and other large targets. You as an individual are not on their radar, unless you’re emitting at high power, Or your activities result in complaints, and your interference is willful. I dunno, every analog cellphone I ever owned from the late 90’s on from an Ericsson to a StarTac to even NexTel’s and crappy Kyocera’s have been significantly smaller in size than the average smartphone available today. Especially when compared to Notes and similar “big-screen” “phones”. I can hardly fit some of the new ones into a pocket comfortably. The “older is bigger” trope doesn’t hold water. Sure, go back to the 80’s and they were gargantuan. But there was, for a time, a meme about cellphones getting smaller and smaller, even with some comedians joking about swallowing your phone accidentally. That trend has certainly been reversed. What we have today are more along the lines of a small portable tablet computer than a truly portable telephone. And then there’s the signal quality. Digital comms have pretty much one failure mode with regards to signal strength and SNR/BER/MER: It works or it doesn’t. Analogs had a continuum of failure in this regard… sure it, may have been scratchy, but at least the other person could be understood in the noise to a point instead of just dropping out completely much sooner. There were places back in the day, even considering the relative rarity of cell towers, where one could make a call, be it a poor quality one, where today it is completely impossible simply due to the nature of analog vs digital signals.